Table shuffleboard is one of my favorite bar games. One of the reasons I love it so much is that pretty much anyone can play shuffleboard. And most people also love it right away. 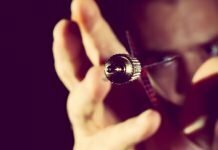 The rules are of the game are simple, but playing it well requires a deft touch, keen accuracy and calculated strategy. Some people see a shuffleboard at a bar and decide that the game looks strange or complicated. They decide it’s not for them. If that’s you, you’re missing out. Don’t worry. After reading this guide, you’ll know everything you need to know about how to play shuffleboard. 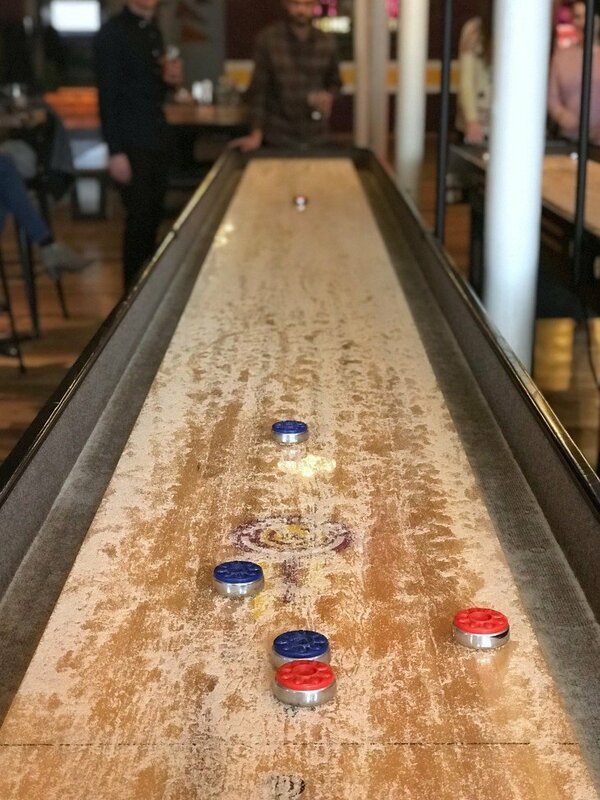 So, the next time you find a bar with a shuffleboard table, you’ll be ready to join in the fun. Learning how to play shuffleboard . . . 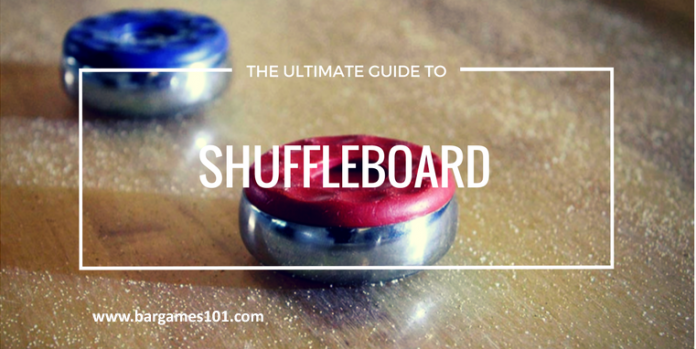 This guide will begin with a basic overview of how to play a game of knockoff shuffleboard with two or four people. Then we’ll go a little deeper into the key rules, basic scoring principles, technique, and standard equipment. 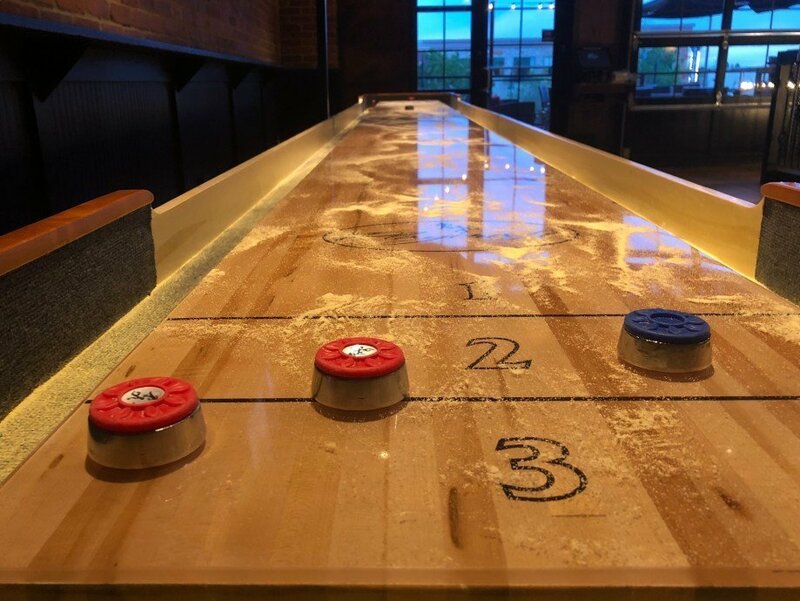 We also review a few other ways to play shuffleboard at the bar. The classic way to play table shuffleboard is known as knock off. If you see people playing at a bar, this is most likely the game they’re playing. Knock off can be played with two or four people. Or can you just play solo and practice. Here’s a snapshot of how to play knock off. You and your opponent will stand at the same end of the table. Decide who gets the red pucks and who gets the blue pucks. There are eight pucks total. These are also called weights. Now decide on how many points to play to. The standard numbers are 15 or 21. You will alternate turns sliding your pucks towards the opposite end of the table. Your goal is to shoot your puck as far down the table as possible without falling off. Your puck must slide beyond your opponent’s farthest puck to score. It must land in a scoring section, of which there are three. However, if the puck hangs over the far edge, it is worth 4 points (known as a “hanger”; more on that below). Only one player can score per round. You can also knock your opponent’s pucks off the side or end of the table. Hence why it’s called Knock Off. You can also make contact with your own pucks to push them into better scoring positions. After shooting all 8 pucks, you have completed one round. Both players now move to the opposite side of the table to review the puck locations. Do not touch any pucks until both players agree on the score for that round. After determining the score, begin the next round from this end of the table. Rounds continue until one player reaches either 15 or 21 points. Knock Off shuffleboard is also fun with four players. First, choose your teams of two. You and your teammate stand at opposite ends of table, each standing next to an opposing player. You stay at your end of the table for the whole game. No alternating sides in this one. Otherwise, it’s the same as the two person version. You and your opponent alternate slides towards the opposite end. Try to slide your puck into scoring positions. Only the farthest puck(s) of the same color will count. You can also knock pucks off the table. And, in team shuffleboard, a bonus is that your partner can offer some guidance from the other side. After you agree on the score for that round, the next team begins their turn, shooting from their side of the table. Four person games are usually played until one team reaches 15 or 21 points. Playing doubles is a great way to enhance the social aspect of the game and get more people involved. As mentioned, most games end when a player reaches 15 or 21 points. 15 points is the standard number used in official tournament play. Many people still play to 21 points though. Unless the bar or house shuffleboard rules differ, the number is up to you. In knock off, the first player or team to reach 15 (or 21) wins. There is no “win-by-two” in the classic game of table shuffleboard. Points only go to the furthest puck (or pucks) of the same color. The shuffleboard table has three scoring sections. The first zone awards 1 point per puck. And all pucks must completely clear the center foul line to be eligible for points. On most shuffleboard tables, the foul line is across the middle of the table. If your puck does not clear the foul line, it is out of play. Remove it from the table. The second and third scoring zones award 2 and 3 points respectively. A puck must be completely within a scoring zone, not touching the preceding line, to be eligible for those points. If any part of the puck is on the preceding line, it is only eligible for points in the lower section. When it’s too close to call, try to get above the puck to look down. From this angle, if can you see even a sliver of wood between the puck and line, it will score in the higher points zone. And if you need to lean on the table to get a better view, that’s fine. But do not shake the table or move any pucks in the process. A “hanger” scores when any part of a puck extends beyond the edge of the table end. Even if it only a sliver is over the edge at the end of the table, it is still a “hanger” and worth 4 points. Yet, if the puck falls off the edge before your opponent’s shot, it’s out of play and does not score. Also note that players can agree to make hangers “safe” by pushing the puck back towards the table. This is a common shuffleboard courtesy and included in the official shuffleboard rules. Place a puck on its side and press the top end against the end of the playing surface. Now slide the puck along end of the table. If this puck makes contact with the disputed hanger, you know part of that puck was hanging over the end of the table. It would be worth 4 points. An abbreviated version of shuffleboard rules for quick reference. Now that you have a basic understanding of how to play knock off shuffleboard and how to keep score, here’s a deeper dive into the rules that apply to standard games. 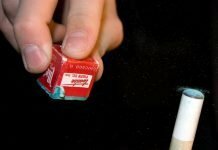 While you can also play to 21, or any other number for that matter, an official match is played to 15. The first player or team to reach 15 points wins. 2) Before the first round, determine who shoots last in the round by flipping a coin. Shooting last (the “hammer”) is an advantage. It allows you one final chance to move (or remove) pucks in your favor. In subsequent rounds, the player who scored in the previous round now shoots first. If nobody scored, alternate based on who just shot last. 3) Stand next to your opponent and shoot towards the opposite end. You should alternate shots (i.e. red shoot, then blue shoots) until all 8 pucks have been shuffled. If playing doubles, your partner stands at the opposite end of the table and you do not change sides. 4) Stand with at least one foot behind the table. You can lean forward and even use the cradle for support, but one foot must always remain planted on the ground behind the shuffleboard table. If any part of the puck is on the preceding line, it is only eligible for the lower points of the preceding section. If touching the foul line, it is out of play. You can get a better view of whether it’s on the line by standing above and looking down on the puck. Also known as a “hanger”, these shots can be “made safe” (i.e. pushed back towards the table a little) by agreement of the players. When the round is complete, walk to the other end of the table and tally the score. Do not move any pucks until both players have viewed the pucks and agreed on the total points for that round. 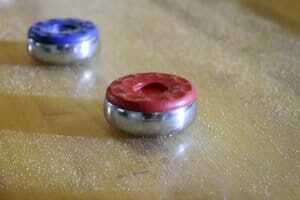 If the leading pucks are tied, and it is not clear which is furthest, there is no score for that round. Again, for this situation it is best to get above the pucks and look down to assess which one is furthest. You can lean on the table with your non-shooting hand for support, but do not move or shake the table in any way. Shaking or moving the table during a shot is a 1 point penalty and the violating player or team shoots first in next round. When it’s not your turn, you should always stand behind your opponent when he or she is shuffling. Like golf, you should not obstruct an opponent’s line of sight or distract them. Also you may not touch the table while your opponent is up. Before playing, all pucks should be visible and counted in the trough. When it is your turn to shuffle, only hold a single puck in your hand. Do not hold another puck in your non-shooting hand. All pucks must stay in the trough and only picked up when it’s your turn to shoot. You can lean on the cradle for support but do not touch the actual playing surface. You cannot touch the playing surface when an opponent is shooting either. This can be done during your turn. But as mentioned, your teammate can tell you where your puck sits and give advice from the other end of the table. In singles matches, you can walk to the other end to take a look at the exact location of your pucks when it’s your turn. Do not do this while your opponent is shooting though. It’s okay to take your time. Yet according to tournament rules, taking more than 30 seconds to shoot is “slow play”. The clock starts once your opponent’s previous shot has come to a complete stop. In tournament play, the first time you exceed the 30 second time limit you get a warning. The second time results in a 1 point penalty. Not everyone applies a strict time limit during a friendly game. But it may be helpful if you have others waiting to play and need to speed things along at the bar. When playing in teams of two, you can take official timeouts to confer with your partner. Official rules say this can only happen after you’ve reached 10 points. You can take 1 timeout per round but no more than 3 timeouts per game. The 30 second time limit does not apply during timeouts. Even if your puck makes a miraculous recovery and bounces back, it is still considered a dead puck and out of play. A puck that flips over upon contact is not out of play. Turn it right side up and carry on. This is an important one. Do not slide your puck until your opponent’s puck has come to a complete stop. This means there is no more forward motion. If you shoot while your opponent’s puck is in motion and knock that puck off the table, you incur a penalty. You must return your opponent’s puck to its original position (or as close as possible), and your puck will be removed from the table for that round. If you have the hammer in a round but shoot first anyway, you must stay in this order until the end of the round. But your opponent can agree to restart in the correct rotation. If you pick up and shoot the wrong color puck, you may replace it with the correct color. But you may not switch colors at any point once the game has started. 22) After the Game . . . Wipe the board down and apply a light dusting of fresh powder for the next match. Winner stays on. 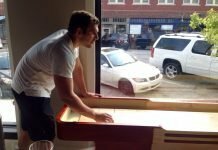 Although knock off is by far the most popular way to play table shuffleboard, there are several other fun games you can try out. 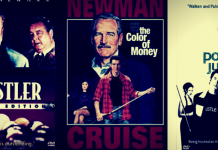 Here are three of our favorite games other than knock off. Keep in mind that the basic shuffle board rules mentioned above apply unless otherwise noted. Crazy Eights is a fun game for a couple players or larger group. Each player shoots all eight pucks. You begin with 4 of the same color, shooting them all at once. Then you aim for the first 4 pucks with the next color, shooting each individually. Your goal is to knock each of the first color pucks off the table and keep at least one or more of the second color pucks on the table in order to score. Every player gets to finish the frame and the highest score that is equal to or greater than the agreed upon game points (e.g., 1-points, 15-points, 21-points, etc.) is declared the winner. The players decide on a number of points that you must reach in order to win. This can be any number the group decides (i.e. 1 point, 5 points, 15 points, 21 points, etc.). Each player starts with all 8 pucks (red and blue) per turn. For each turn, you start by shooting all 4 pucks of the same color with one hand. That’s a single shot with 4 pucks in a group. All of the first 4 pucks must cross the long foul line (closer to the opposite end) and remain on the table. If any single puck does not cross the line or falls off the table, your turn is over and the next player is up, shooting from the opposite end. If all 4 pucks cross the foul line and stay on the table, shoot the next 4 pucks one at a time. Your goal is to knock off all the previous pucks from the table. Only pucks that stay on the table after the first color pucks have been knocked off will score. If any of the first 4 pucks remain on the table, there is no score. Either way, the next player is now up. Every player gets a turn to shoot 8 pucks in each frame. Even you reached the designated points total, all players still have a chance. If you shoot last (the “hammer”) and score equal to or more than the designated points, you win. If you there is a tie with another player, those players will shoot an additional round to determine who wins based on points in that round. Points are awarded just as in traditional shuffleboard (1, 2, 3 or hanging 4). To score in a higher point zone, the puck must completely cross the preceding line to count. For example, if the puck is even touching the line before the “2” section, it only counts as “1”. Good players will try to knock as many of the first 4 pucks off of the table with each single shot. So if you manage to knock all 4 reds with your first blue puck (quite a shot! ), you would have an open table to rack up some points. Tap & Draw, the kinder and gentler version of ‘Knock Off’, is a great 1-v-1 shuffleboard game. In Tap & Draw you are penalized if you knock your opponent’s puck off the table. You are still trying to advance your pucks into better scoring zones. But you don’t have the benefit of playing defense or racking up points by clearing out your opponent’s pucks. Flip a coin to see who goes first and assign colors (red or blue). Decide what number to play to. Only pucks that are further down the board than your opponent’s highest scoring puck will count (just like Knock Off). You can try to nudge your puck into better scoring positions by tapping it forward without knocking it into the gutter. If you knock your opponent’s puck into the gutter, their puck will be replaced in its original position. Your puck will be removed from the table. If, when you knocked your opponent’s puck off the table, any of your other pucks were pushed into better scoring positions, they will be returned to their original spots. Your opponent’s puck would be put back in its original spot. If you tap any of your opponent’s pucks into better scoring positions, they will remain there. Alternate shots with your opponent until all 8 pucks have been shuffled. After a single round, go to the other end and count the total score before moving any pucks. Then start the next round from this end. Scores are counted per the basic rules of shuffleboard. That is, each puck must completely clear the preceding line to count in the high point zone. Hangers are worth 4 points. And you typically play to 15. Although this number is really up to you (21 is also common). Three strikes is a fun shuffleboard game for small or large groups of players. This game is not played in teams; it’s every man for himself. The object of the game is to score more than the previous player. If you don’t score more than the player before you, you get a strike. After three strikes, you’re out. Each player shoots 4 pucks per turn. The 4 pucks include: 3 of the same color (i.e. red) and 1 different color (blue). The 3 red pucks are your scoring pucks. The single blue puck is the “multiplier”. The pucks can be shot in any order. You shoot all pucks towards the opposite end as in other games. The scoring zones are the same (1, 2, 3 and 4 for a hanger). However, the multiplier is used to multiply the total amount of points. For example: If you slide 1 red into zone ONE, and 2 reds into zone TWO, your current score would be 5. But if the multiplier ends up in zone THREE, your final score would be 15. Each player must score higher than the previous player’s score. Using the same example, if you scored 15 in your round the next player must score at least 16 points. If that player only scores 5 points, he or she gets a strike. The next player would have to beat 5 points. If you get 3 strikes, you’re out. Three Strikes is a really fun way to practice your skills and get a larger group of players involved. 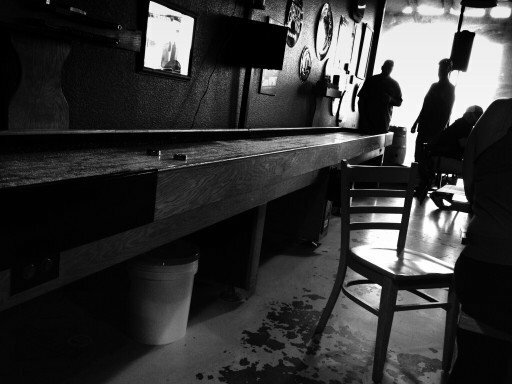 Like any classic bar sport, it takes time and patience to learn how to play shuffleboard and become a skilled player. But a little practice and muscle memory will go a long way. A shuffleboard stroke should be soft and measured. Notice how skilled players have a very slow and controlled motion leading up to the release. Their follow-through keeps the same steady pace. To reach a basic comfort level with your release, take a few slow and controlled practice shots. Notice how little effort it takes to float your puck to the opposite end of the table. After mastering the speed of your release, try working on your accuracy. For instance, practice aiming for different points on the table. This could be different scoring sections, opposite corners or triangular formations. Remember, game winning shots often come down to millimeters. The ability to place your pucks in better scoring positions with soft and precise shots is key. Also, spreading your pucks out is a good strategy to use when facing an opponent. It makes it harder to knock many pucks off in a single shot. You should hold a puck with the thumb, index and middle fingers. This is a soft, three finger grip that leaves the other two fingers available for guidance. The thumb stays on the near rim of the puck, while the index finger is on top cap and the middle finger is at the far rim. Try to use the ring and pinkie fingers to glide in front along the surface while you slide with the puck. This can help control both the speed and accuracy of your shots. You’ll soon get a feel for the speed of the table and the right amount of effort needed to cross the foul line and place your puck within scoring position. 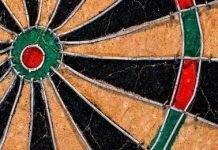 As you play more – even over the course of just a couple games – you will develop a consistent pace with better accuracy. This is when the game of shuffleboard really gets fun. 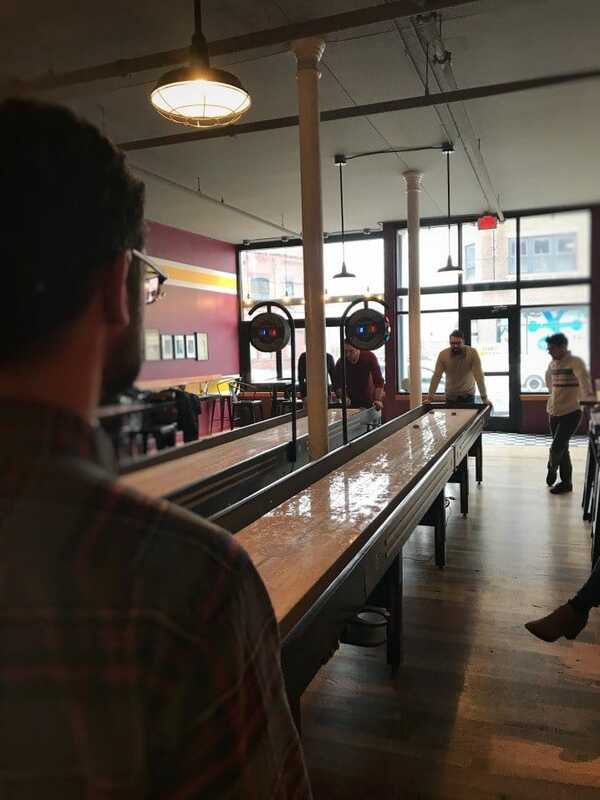 The game of table shuffleboard has some unique physical features. In addition to reviewing the rules of how to play this game, it’s also helpful to know more about the equipment you’ll be using. Here’s a quick review of essential shuffleboard equipment. Starting with the table. A shuffleboard table has a long and narrow playing surface. In fact, the length of a full-sized tournament table is 22 feet. That’s over twice the length of a regulation pool table. The playing surface of an official table is 20′ 8″ long x 20″ wide. And the height of the table to the top of the playing shuffleboard surface is 30 inches. If you’re at a bar with a full size shuffleboard table, consider yourself lucky. It’s a real pleasure to play at this scale. But to fit in the tighter spaces of bars and basements, recreational tables can range anywhere from 9 to 20 feet. Recreational shuffleboard tables also vary in width. But it’s definitely more fun to play on a table with a surface that is at least 18” wide. This allows for adequate spacing between the pucks on the table. Check out our guide to shuffleboard table sizes to learn more. If you’re looking for a smaller table that doesn’t come with a huge price tag, check out our guide to some of the best affordable shuffleboard tables on the market. Shuffleboard tables have hardwood playing surfaces. High quality surfaces are usually made from maple and coated with epoxy to protect against dings and scratches. Most surfaces are also concaved. This means the center line angles inward to keep pucks from wandering off. If you own a table, clean, wax and spray the surface with silicone on a regular basis to maintain it. You may notice that powder covers the playing shuffleboard playing surface. 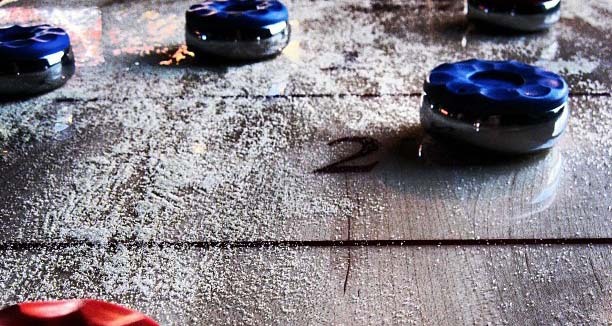 Shuffleboard powder is sometimes called salt or wax. But the powder is actually made from silicone beads and cornmeal. The powders come in different blends depending on your table length and skill-level. The powder helps provide a fast, smooth and straight glide. You can apply a new coat for each game. Also, a player can apply powder from the gully if they notice dry spots before a shot. Learn more in our guide to shuffleboard powder. Regulation size table shuffleboard pucks are 2.3125 inches wide. Smaller pucks measure closer to 2 inches wide and are better for narrow playing surfaces. Pucks come in sets of eight: four red and four blue. Official pucks weigh about 12 ounces, but recreational pucks can range anywhere from 11 – 15 ounces. 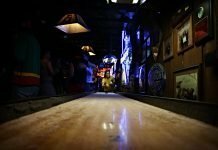 If you haven’t played before, hopefully this guide will give enough info to get started with table shuffleboard at your favorite watering hole. You may have noticed that the game has been showing up at more bars and breweries these days, so why not give it a shot!